St. Bernardin Resort hotels offer special conference prices for SEE SDEWES participants. To get the special price please send an inquiry and indicate in the "comment section" that you are attending the SEE SDEWES conference. Room are available at special prices only until April 15, 2016. Please make your reservations as soon as possible! For all questions, please contact the hotel at booking@bernardingroup.si (tel: +386 5 6907000, fax: +386 5 6907010). Grand Hotel Bernardin forms a part of the prestigious St. Bernardin hotel complex with a private beach, situated between Piran and Portorož. The services exceed 5-star quality in many aspects. 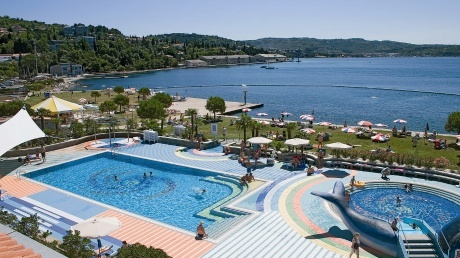 The hotel and its surroundings are an ideal place for a perfect holiday on the Slovenian coast. Surrounded by peaceful, green settings and overlooking the sea. Next to the former monastery church of St. Bernardin, after which the hotel complex between Piran and Portorož was named, sits Histrion Hotel. Hotel guests have direct access to the Laguna Bernardin Water Park, Wellness Center Laguna and Casino Bernardin. Hotel Vile Park, part of the holiday resort St. Bernardin located between Piran and Portorož, comprises 5 villas with a capacity of 216 rooms – Vila Galeb, Vila Galeja, Vila Orada and Vila Nimfa and Vila Barka with 21 apartments. All villas are connected with a lovely shopping street with bars and restaurants, which leads to the Marina and sheltered by the lush Mediterranean vegetation. Accommodation 4-7 nights: 10% discount on overnights. Accommodation 8 nights and more: Additional 5% discount on overnights. Customer's Guest Room Rates in Grand Hotel Bernardin; Hotel Histrion and Hotel Vile Park include: accommodation with rich buffet breakfast, entrance to the hotel swimming pool, free entrance to the Water Park Laguna Bernardin, wireless internet access (GHB, HH, HVP), entrance to the Casino Bernardin, VAT. Free of charge parking is available for hotel guests very close to all three hotels. To access the Grand Hotel Bernardin parking the following address needs to be entered in the GPS device: Ladjedelniška Reber 13, 6320 Portorož - Portorose. Customer's Group Room Rates are subject to applicable tourist tax of 1,27 EUR/person/day.